For achieving high precision and accuracy one needs to have right tools and the right surface for fabrication of high precision products. We offer a wide range of surfaces with specific dimensions and orientations to suit every need. Get the perfection that you deserve with JASH's Precision Surface Equipment. No tool is truly complete without supporting aids and accessories. JASH's extensive line of machine accessories and tooling aids help to keep the product in place and at the desired angles so that work may be done conveniently and with high precision. Increase your productivity and accuracy with highly versatile machine accessories and tooling aids provided by JASH. 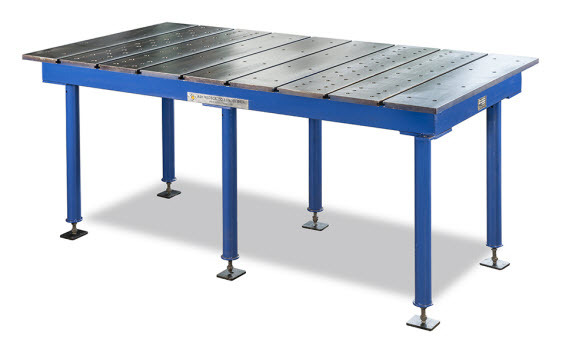 Eliminate distortion and facilitate accurate inspection with JASH's Bed, Clamping and Welding Plates. The products in this category serve as excellent reference bases for inspection, tool making, spot marking, layout operations and gauging. Enhance the precision of your welding methods with high quality plates, clamps and welding beds. Measurement is the essence of precision tool fabrication as each minute value can bring about a major change. JASH offers measuring machines with 3D coordinate compilation and layout marking capabilities. Leave no scope for errors in measured values with our state of the art measuring machines. JASH Vibration Isolation Work Table (VIWT) is mainly known as Optical & Opto-Electronics Laboratory Work Table used in Laboratories as Work Station for PASSIVE ISOLATION for sensitive equipment like Laser, Optics, Optical and Electronic Scales, Medical Equipment and measuring instruments. Ever wondered how industrial grade machines are able to work with such high efficiency while maintaining the highest quality levels? For achieving such high efficiency levels, the machines are cut into the desired shape with the use of high precision cutting tools. The greater the precision in the design, the greater will be the quality of the output. Precision cutting tools are available in different grades for being able to work with various metals. After all, durability of the tool’s composite material is a crucial aspect that needs to be given due consideration when considering the ways in which your product needs to be shaped and cut. Let’s take a look at how these high precision engineering tools are made. You need a very durable grade of steel or tungsten carbide (a material which is stronger than steel) to start the precision cutting tool manufacturing process. These materials are highly durable and can withstand the heat and the force that is generated during an average cutting procedure. Now steel, in its raw form, is quite easy to work with. The material can be cut and shaped as per requirement. But it requires huge quantities of lubrication to cool down the tools as the friction caused by metal on metal generates high levels of heat which can damage the system as well as the product if left unchecked. Now that the raw material has been sourced, the next step would be to cut it up into usable sized units which would be shaped into the final product. Band saws are used, along with lubrication, to cut the groups of steel bars into small length units called blanks. From here, the process actually takes off. Computer operated ladles then help to keep the blanks in place while the machine first removes some material from one end of the blank to form a sharp point. The next step involves the use of drilling to flatten the other end and carving a central hole. Once this is done, the diameter is trimmed down to the correct measurements. This is by far the most important part of the process. The prepared blanks are put in a computer operated milling machine which carves out flutes on the blanks and this marks the creation of the precision cutting tool. Flutes are actually ridges that run the full length of the blank and form the basis of the actual precision cutting tool. These flutes are responsible for ensuring the type of cut / shape made by the tool and the level of accuracy achieved by it. Lubrication is required at this stage also to prevent over heating of the components. Once the flutes have been made as per specification, the blank becomes a rough tool and from this point onwards, the blank is referred by its ends. The shorter end is called the shank while the longer end is known as the cutting end. The type of ridge formed during the fluting process depends on the model for which the cutting tool is being made. With the steel being brought into the desired shape and specifications, the tool needs to be cured to make harden the steel. This is done using a two-step heating process. The first stage involves the use of molten salt which hardens the metal. The tools are in fact soaked in 5 salt baths, with each bath being progressively hotter than the previous. Temperature variations in this phase range from 650 degrees to 1200 degrees Celsius. The second phase of the heat treatment involves the use of induction where each tool is placed between large metal coils. The magnetic field of the coil generates intense heat and this softens the shank. The softening of the shank makes it more flexible. With the metal being hardened and the shank being made flexible, the tool becomes ready to be finished off. The shank is run against a grinding machine where the surface includes diamond particles. Diamond particles are the key to integrating high precision levels into the tool as the strength of the diamond coated surface helps in fine grinding. The final diameter of the tool is verified using a digital micrometre. Once this is done, the tool is processed through a computer operated high precision grinding machine for finishing off the cutting end. Diamond based grinding wheels are used for this process as precision is the most crucial requirement at this stage. More sophisticated tools are fine-tuned with greater precision grinding to achieve the perfect specification. With this completed, you now have a brilliant, high precision tool that would help in maintaining higher accuracy levels.